ANNVILLE, Pa. - Lebanon Valley College received a piece of program history and a good luck charm on Friday, as the game ball used by LVC Hall of Fame quarterback Roy Albright '30 to beat Franklin & Marshall in 1929 was donated to the team. The Dutchmen will open their season at F&M on Saturday, the first meeting between the old rivals since 1982. 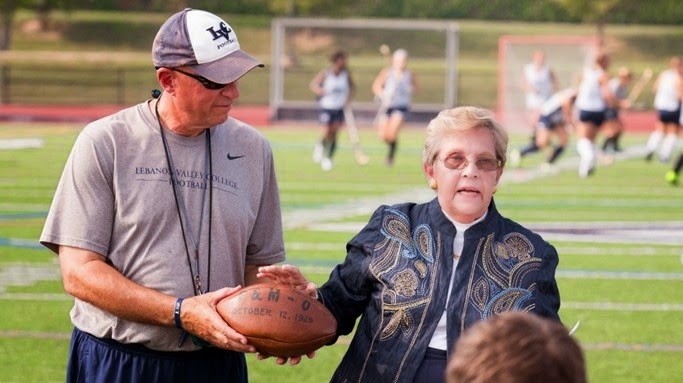 Albright's daughter-in-law, Betty Albright, presented the ball to head coach Jim Monos and explained its significance to the team. Albright, a native of Ephrata quarterbacked LVC to an upset 6-0 win over F&M in Lancaster in 1929. With the game scoreless into the fourth quarter, LVC generated a turnover in the Diplomat red zone and quickly moved up to the five on an Albright pass. Three running plays went no where, and on fourth down, Albright executed a fake end run that became a double lateral, first to Paul Bowman and then to Lloyd Daub, who scored. Albright, who played three sports and was inducted in the LVC Hall of Fame's third class in 1978, kept the ball as a prized possession until his passing in 1980. Upon hearing that LVC and F&M were renewing their series for the first time since 1982, his daughter-in-law Betty wanted the ball to come home to Annville. She told the story of the ball and Roy's career to the team and met with natives of the Ephrata area, including Ephrata High graduate Jeremy Franck, Cocalico grads Kevin Antol and Spencer Moser, and Conestoga Valley product Tyler Good.